One of the best-loved tales about the Thurston County commission is how they "chased" Ritchie Brothers, an auction business dealing in large equipment (cranes, tractors and such) out of the county a few years ago. I've poked around before looking for evidence of this, but I never really came up with anything. But, the story keeps getting repeated (without much, if any, citation), so I thought I'd dig down into it. But, what I've yet to find is any sort of smoking gun, any sort of specific example that anyone can point to as the axle upon which this County Commission vs. Ritchie Brothers narrative can turn. There's not expansion proposed that the county shuts down because of environmental protections. There's no new expensive sewer system. Nothing. So, let's take a look back where this all begins when the Ritchie Brothers company starts talking about a possible move from Thurston County. Even with a stumbling economy, businesses and people still show up by the thousands to place their bids. If anything, Cunningham thinks the recession has helped business. "Instead of buying new equipment, more people are looking to buy used equipment," she said. Things have picked up so much for the auction company at their location off of exit 95 in South Thurston County that they're potentially mulling an expansion to Lewis County, due to some of the possibilities along Interstate 5. Unsure of when or where the auction will move to, Giroux is absolutely certain more space is needed than the current location offers. "It's not nearly enough room here," Giroux said. "We're bursting at the seams, and we're definitely interested in finding a much larger parcel. But whether we go north or south depends on the property availability." And the price, he added. Co-founder Dave Ritchie was on hand for Thursday’s grand opening as was current president Rob Mackay. Mackay said the company simply had outgrown the Thurston County site. Given the opportunity to throw shade, the Ritchie Brothers' folks did not. At every turn when asked, they'd respond: we don't have enough room, we want something larger. While there were likely parcels in Thurston County that could've been big enough, combining one that would've been appropriate for a commercial operation and near Interstate 5 was likely a hard find. At least from the company itself, you can't find the narrative that Thurston County government was being mean and chased them out. Once you start looking down in Lewis County after the auction company moved south, you start to see a new narrative form. “We love Lewis County so far,” Mills said. The company moved to the new site right off Interstate 5’s exit 68 from its previous location at Maytown in Thurston County. The new 200-acre facility quadruples the size of the Thurston County site. The county had to rezone the property for commercial use because it sat on agricultural resource land. Ritchie Bros. will now hold five auctions a year in Lewis County. “When you consider the county gets one percent sales tax, that’s significant,” Averill said. Still the Ritchie Brothers company itself is consistent, there was more room (four times the room) for them to operate near Napavine. Being that it's Lewis County too, the land was likely cheaper while still being right next to I-5. What you do see is a Lewis County Commissioner throw shade north, at least indirectly. Lewis County wanted to make sure they had a smooth landing, see? But, even there, he's not referencing any specific problem Ritchie Brothers had with Thurston County. If anything, it was the Ritchie Brothers company that hurt the economic possibility of their old site. When they moved on, they placed a deed restriction on the parcels to ensure another auction company wouldn't move in behind them. The Thurston County buyers won’t be offering auction services on the property because of a deed restriction placed on it by RitchieBros., said Troy Dana of Olympia-based Dana Commercial Real Estate. He said his client, which offered auction services but does not compete with Ritchie Bros., declined to bid after learning about the deed restriction. “It took away part of the business model,” Dana said. He said his client, an undisclosed out-of-state business, was prepared to bid up to $2.5 million for the three parcels. Instead, the property sold for $1.47 million. “That’s the impact of the deed restriction,” Dana said. But, despite the deed restriction that limited the use of the property, it sold anyway. And, again it became a going concern, pumping money into the Thurston County economy. And, this is where the entire County Commission vs. Good Business thread falls apart. When you take a drive down I-5 to what was the old Ritchie Brothers site. Instead of laying empty the site is now occupied by a very similar business, Valley Freightliners. While Ritchie Brothers held periodic auctions for used large equipment, Valley Freightliners is a regular dealer in new and used semi-trailer trucks. If it were true that the Thurston County commissioners were chasing retail large equipment sales out of the county, they were doing a really bad job of it if Freigtliner was ready to move right back in. Initially VFI was searching for land when broker Don Moody of CBRE brought this high visibility site to their attention. Previously owned by Ritchie Bros. Auctioneers, VFI purchased a 34 acre parcel along with the existing high bay structures. "It presented a great location on I-5 with an existing infrastructure that aligns with our needs," said Bernasconi. The location has good access and visibility, along with ample parking. It also has an existing facility that fits the truck dealership model. Some minor remodeling and basic updates will be done to optimize its use. "We're hoping to get permit approval from the county in the next couple weeks," shared Bernasconi. I had one one last place to look for a smoking gun. I thought since permitting and land use records are available online, I'd find some sort of file of correspondence between Ritchie Brothers and the county. Going through the permits and paperwork online at Thurston County, I was only able to find one active project around that same time. Ritchie Brothers was working on a permit for a septic system for a ten person office building and auction yard. You can search through the documents here (use the tax parcel number 12605330400). From my reading of the permit file of the parcel, activity seems to drop off as Ritchie Brothers start exploring new opportunities in 2009 and then it picks back up when Valley Freightliners moves in three years later. Either way, if they were looking to get out of the sewer/septic business by heading south, it looks like they're out of luck. Two multimillion-dollar auctions that were cause for celebration last year now are the cause of a pricey renovation for Ritchie Bros. Auctioneers at its freeway site between Napavine and Winlock. The state Department of Health is mandating that the heavy equipment auction company upgrade its onsite sewage system, which could cost up to $70,000. During two auctions last year, the 3,500-gallon septic tank — the size usually used by small commercial businesses — was overwhelmed, said Denise Lahmann, the program and reclaimed water supervisor for the Office of Shellfish and Water Protection at the Department of Health. For Lewis County, the costly mistake could become a lucrative new business venture — if the Richie Bros. goes along. According to the Lewis County Commissioners, Ritchie Bros. has expressed interest in partnering to build a commercial-level sewage system — one the county could use to encourage further development around Exit 68, where Interstate 5 and state Route 12 meet. I read your article, in last Saturday’s issue, regarding problems that Ritchie Bros. are having with the State of Washington regarding its current septic sewer system. I have been aware, for quite some time, that Lewis County was wasting time and valuable taxpayer funds in an effort to justify a separate and additional “wastewater system” to benefit not only Ritchie Bros., but “potential” development of “new restaurants and hotels” in the Exit 68 area. Excuse me, but Ritchie Bros. is in the city of Napavine service area, and service to that facility is within Napavine’s State of Washington approved comprehensive, water and sewer plans. Additionally, Napavine has sufficient capacity within its water and wastewater facilities to service the entire Exit 68 area as is indicated in our water and wastewater plans. It seems to me that Lewis County, rather than working with the city of Napavine, is participating in a naked power grab in the guise of “helping” Ritchie Bros.
And, lastly, if not for some mysterious sewer debacle that has been left unmentioned, what about the impact of Ritchie Brothers leaving Thurston County. Even if the county commissioners did not wage an open war against large scale heavy equipment auction houses, certainly them leaving tanked the county's sale tax receipts. Maybe even the appearance of Valley Freightliners didn't save the day for the county economy. But, if you spread out taxable activity in Thurston County from 1995 to 2014 (the most recent annual data available) the Ritchie Brothers impact in nearly invisible. Here's the data I'm working from and here is the source. But, this chart I think speaks for itself. It tracks taxable sales activity in unincorporated Thurston County by units and total taxable. Certainly you do see a dip in taxable activity from 2011 to 2012, and possibly that is the time when Ritchie Brothers was wrapping up and Valley Freightliners was coming online. 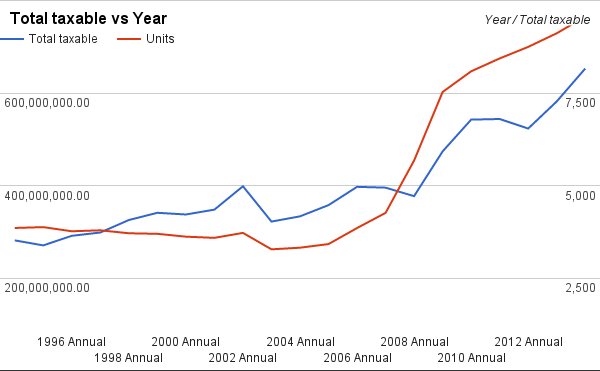 But, there is no blip in the units line, which consistently shoots upwards. What this chart does show is a steep increase in taxable activity in unincorporated Thurston County since 2008. That's when Sandra Romero was elected. Just in case you're still tracking me. The reason the Thurston County site "wasn't big enough" was because the Mazama pocket gopher mitigation required by Thurston County precluded the expansion Ritchie Bros. was seeking. I remember looking over their permitting work during my time on the STOP Thurston County project. Lewis County courted Ritchie Bros. by offering the new zoning and the fact that there were no problems with gopher mitigation. This is what COL Averill was referring to when he mentioned "unnecessary environmental restrictions." Not to mention that we now have a prolific species listed as endangered because of activism. It was a serious Galileo/geo-centrism moment, only at the BoCC. @Justin I couldn't find the permitting paperwork you're referring to, do you still have copies? thanks for a very comprehensive look at this lingering issue. I hope you've put it out there adequately to quiet the folks who instinctively lay blame before learning the facts. Ritchie Bros. moved and now their septic problems belong to Lewis Co. so be it! Your article indicates the job loss was not significant.